The occupation authorities in the Crimea began to draft protocols on administrative violations for participation in solitary pickets on October 14, according to the reports on the website of the Crimean Human Rights Group. Thus, a protocol drafted against the inhabitant of the Crimea, Usein Useinov was published on Facebook. 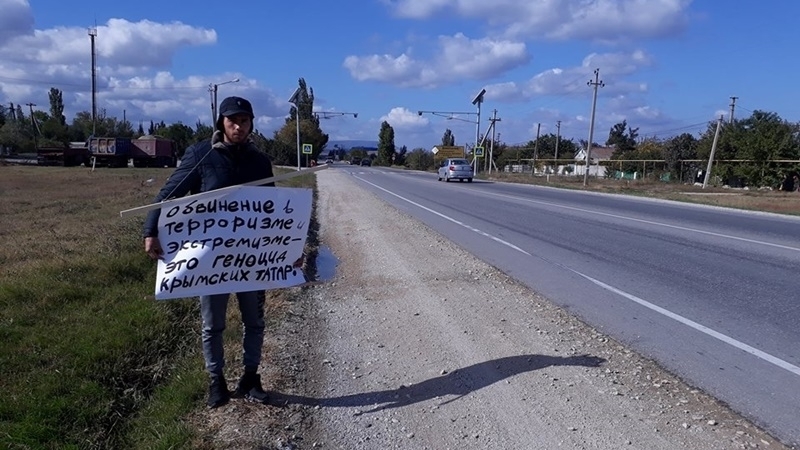 “On October 14 at 12 o'clock Useinov, standing at the highway Armyansk-Simferopol in the Voronezhskaya street of the village of Sofiyivka, holding a poster with the inscription "Muslims of Crimea are not terrorists and not extremists", took part in a public rally held by Crimean residents in the guise of single pickets,” the protocol says. He was charged with committing an offense under Part 5 of the text. 20.2 of the Code of Administrative Offenses of the Russian Federation. Apart from Usein Useinov, another 10 people received summons. They are required to come to the police department for drawing up an administrative protocol. These summons were published by Dilyaver Asanov and Muslim Zavriev on their Facebook pages. Reference: October 14 across the Crimea, people came out with pickets, protesting against the arbitrariness of the occupants against the Crimean Tatars. People took to the pickets with posters saying "Stop mayhem of security forces of Crimea", "One can’t win love with violence," "Stop! Arrests, searches, abductions of Muslims! ", "The charges of terrorism and extremism is the genocide of Crimean Tatars"